Horace McCoy’s, along with James M. Cain and a few other authors of the ‘20s, ‘30s & ‘40s, was labeled early on as a hardboiled authors, in the same vein as Raymond Chandler, Dashiell Hammett and others. But, in retrospect, most of his novels didn’t fit the classic description of hardboiled. First, they weren’t detectives. Secondly, the main protagonists were not mainly dealing with solving a mystery and often the main characters were flawed, and if not totally beyond redemption, at least of questionable character. Of course, now these writers are most identified with the ‘Noir’ genre; the ‘roman noir’ or “dark books’ as they would finally be labeled after many of them were made into film noirs of the ‘40s and ‘50s. Reissued in April by Open Road Media, They Shoot Horses, Don’t They? 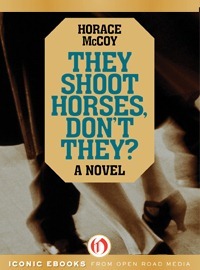 is McCoy’s most well known novel, perhaps because of the Academy Award Nominated film (it won one Oscar for Gig Young as supporting actor, and was nominated in eight other categories, including best director- Sydney Pollack and best actress – Jane Fonda) starring Michael Sarrazin and Jane Fonda. The story opens up with the narrator and protagonist confessing to murder, thus quickly shedding any aspirations to a mystery. He confesses that he "killed her," and that he doesn’t "have a leg to stand on." alluding to the title of the book. In his youth, he saw the favorite family horse break its leg, after which it was shot and put out of its misery, also leading to the conclusion as well as the title. The main characters are Robert Syverten, who came to Hollywood with dreams of becoming a great director, and Gloria Beatty who ran away to Dallas from a farm in West Texas where her uncle always made passes at her. In Dallas, she tried to commit suicide, then ran away to Hollywood with dreams of being in movies, but is finding only rejection. The pair meet on the morning when they have both failed to get parts as extras. The setting for the novel is in the shabby La Monica Ballroom, perched over the Pacific Ocean on the Santa Monica Pier, near Los Angeles. Gloria talks Robert into participating entering a marathon dance contest believing the contest may be a way to get noticed by studio producers or movie stars. The novel was written in 1935, at the height of the dance marathon craze. Dance endurance contests attracted people to compete to achieve a type of cheap celebrity or monetary prizes. McCoy, whose life story very much resembled Roberts, had briefly worked as a bouncer at contest just like this in California. The book also differs from the of hardboiled books of the era in that the plot is nonlinear, being told back to front as well as flash back scenes that reveal the characters back story and histories. From the start we know that Robert killed Gloria and the plot reveals why. Further, the flash back scenes to Robert witnessing the shooting of the families pet horse and how that affected him, his hopes and dreams of becoming a great film director, and the failure he feels in just hanging on and excepting bit parts, to Gloria’s life with the lecherous uncle, her despair in trying to make it as a single girl at the height of the depression and why she tried to kill herself in Dallas before coming to Hollywood to become a movie star. All of this reveals why Gloria, from the start has a fatal outlook for her future, and maybe everyone’s future. From the start, Gloria tells Robert that she wishes she were dead, a point she repeats in most of their conversations. She also feels she has had to resort to unsavory acts, one of which will come out later in the dance contest, just to survive. One hundred and forty four couples start the contest. Robert and Gloria, like most of the contestants, are young, jobless, and drawn as much by the free food as by the $1,000 prize money (raised to the ‘princely sum of $1,500 in the movie). The book was also printed in a dramatic fashion in that the story begins with Robert’s sentencing for murder. He confesses that he "killed her," and that he doesn’t "have a leg to stand on." He is advised to beg for mercy from the Court. The story of his relationship with the Gloria is then intercut after every few chapters with short excerpts from the judge’s sentencing. The excerpts of the judge’s words are written in larger and larger type until the last page of the book concludes with the words written in small print: "And may God have mercy on your soul". They Shoot Horses, Don’t They? has long been considered, along with The Grapes of Wrath as one of the most convincing—and heartbreaking—fictional portraits of America during the Great Depression. It is a stunning portrait of poverty and powerlessness during the Great Depression, as Robert and Gloria, along with the supporting cast of characters risk everything I the grueling dance marathon, to ever more desperately keep their dreams alive, and as those dreams die in the face of the times, just survive. As the dance goes on, into the second and third week, the crowds grow larger and the media come out, as hoped for by the contestants, to cover and sensationalize the contest. Also, the rich and the Hollywood stars that have made it, also come out to watch, almost like people stopping to look at an auto accident. As the contest grinds on, couples break down physically and drop out, and some plot desperately to gain an advantage. The sponsors also stoop to new lows in the hopes of profiting from the desperate dancers. There are rumors of the contest being fixed half way through, and then they weather an attempt to shut down the contest by the local morals society, and Gloria, angry, bitter and outspoken in her desperation, angry, curses the women as spoiled, interfering hypocrites.. I believe that what makes the novel a classic isn’t just it depiction of life in The Great Depression, but its larger parody of life in general, in every generation. It reveals how easy it is for dreams to crumble, and also how our egos can work against us by giving us goals that are beyond our capability to achieve. Gloria dreams and searches for redemption by becoming a Hollywood starlet, when in reality she is not that attractive. this universal theme is what makes the novel a classic and not just a snap shot of a desperate time in history. It’s wonderful to see the book republished by Open Road, who released this book in eBook at the same time they republish McCoy’s other masterpiece of classic noir, Kiss Tomorrow Goodbye, which I will also be reviewing. Both eBooks feature an extended biography of Horace McCoy and are nicely formatted. Article first published as Book Review: They Shoot Horses, Don’t They? by Horace McCoy on Blogcritics. I don't mind a reasonable amount of trouble. Crimeways is always on the lookout for new and soon-to be released or re-released books, special author projects, movie news and distinctive noir, hardboiled and crime-fiction-related Web sites. 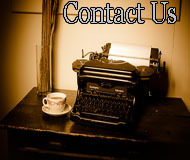 We are also receptive to guest blogs, ideas for posts or noir/hardboiled history projects and research. Drop a dime here. "The big clock ran everywhere, overlooked no one, omitted no one, forgot nothing, remembered nothing, knew nothing. Was nothing.